It has extensive sea views from all rooms including views of the Treshnish Isles and the Isle of Mull. The MV Clansman can be viewed on a daily basis, making her voyage into Gott Bay! The house is in a perfect location for safe, easy and convenient access to the beach. There is a small attached cottage with a separate entrance - sometimes occupied by the owners - and a large adjacent shed. The shed is available for further storage if required. Entrance Porch – Cnoc Ruaig is entered through the porch which leads to the hallway and a spacious kitchen/dining room. Kitchen / Dining - A large bright room with dual aspect windows. 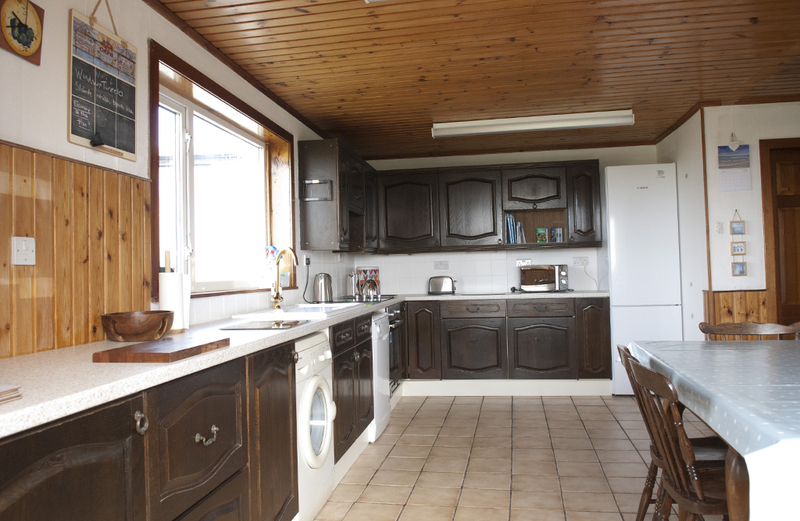 It is fully equipped with electric hob and oven, microwave, large free standing fridge freezer, dishwasher and washing machine. The large dining room table and chairs comfortably accommodates eight people. 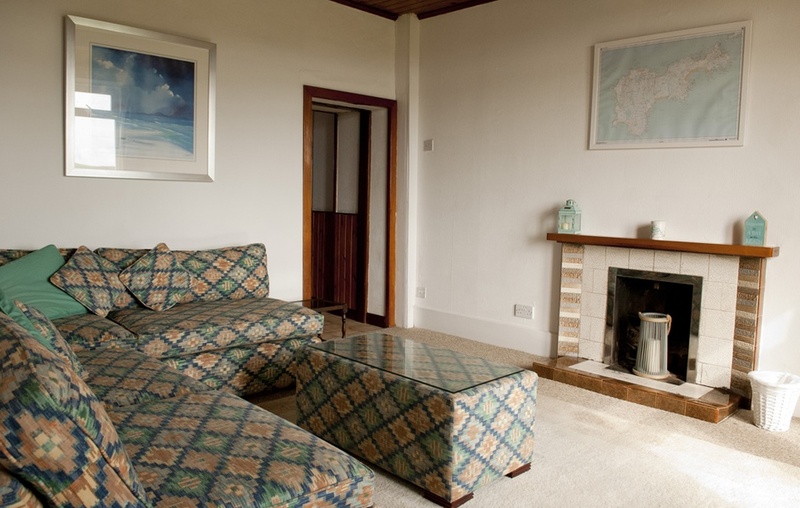 Lounge - This light and spacious room has large comfortable corner seating, a TV and DVD player. There is a selection of DVDs. Hallway - The hallway provides access to the ground floor bedroom, bathroom, stairway and external door leading to the large rear grassy area. Bedroom – This generous ground floor bedroom, with great views, has a king sized bed a wardrobe and drawer storage. Bathroom – The bathroom has a bath with shower over, wash hand basin, wc and heated towel rail. The staircase window allows sea views across Gott Bay and provides a bright upper landing leading to three further bedrooms. 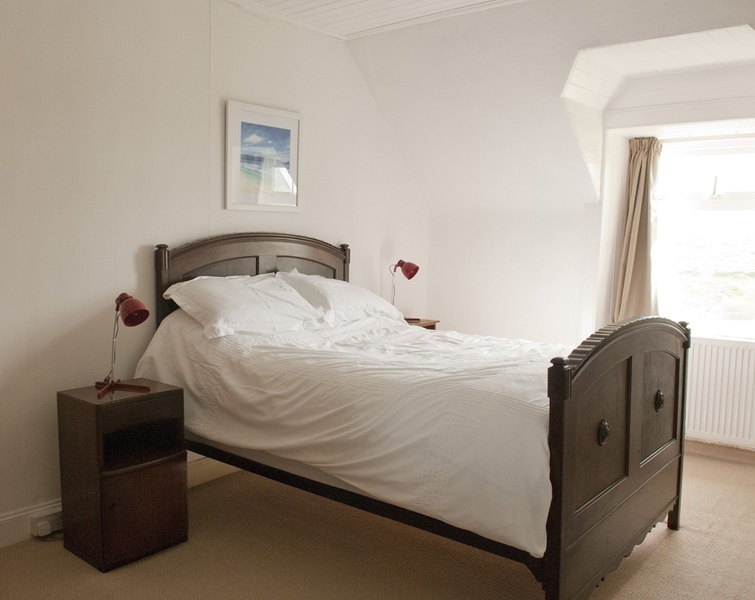 Double Bedroom – Sea views, double bed, wardrobe and mirrored dressing table. Twin Bedroom – Sea views, bunk beds and built in wardrobes. 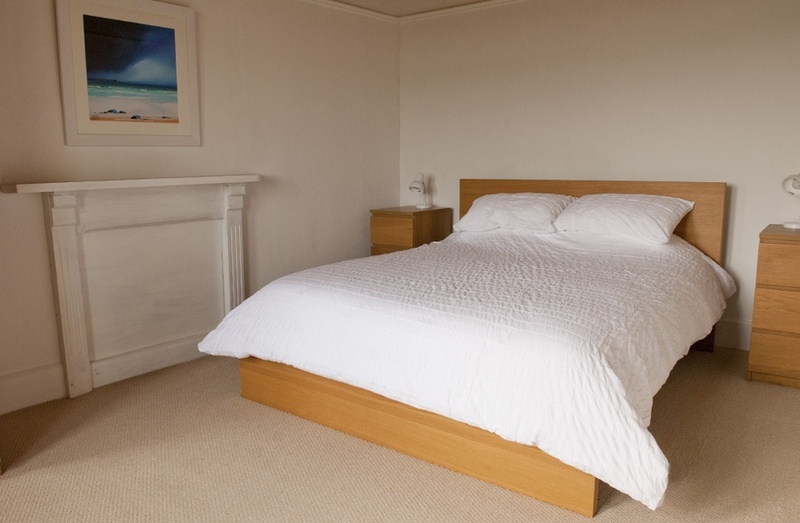 Double Bedroom – Sea views, double bed, wardrobe and dressing table. The house has oil fired central heating with radiators in every room, as well as in both ground floor hallways and the upper landing. Hot water is provided via the central heating boiler. BT broadband connection with unlimited Wi-Fi is provided. A cot and highchair is supplied. There is also a bright useful spacious walk-in storage room on the ground floor. 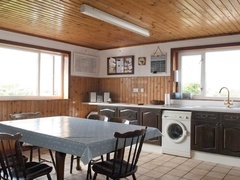 Prices are based on up to 6 people, if the group size is greater than 6, add £90 per person per week. 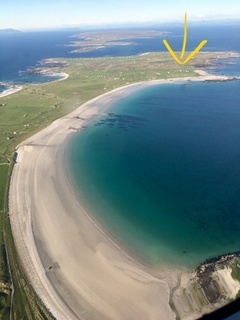 Ruaig is approximately 5 miles from Scarinish pier. Turn right at pier road end and follow signs for Caoles. After travelling the length of Gott Bay you will see the sign for Ruaig. Follow this right hand turn a further ½ mile to almost the end of the road and Cnoc Ruaig is set back on the left. 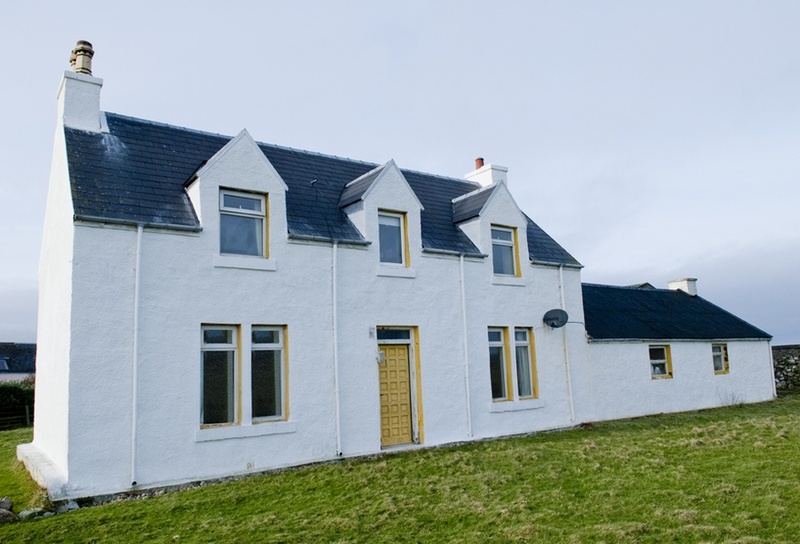 Cnoc Ruaig is situated on an expansive grassy area. There is ample parking on the courtyard. There is a large outdoor picnic bench and washing/drying line. Guests are asked to vacate the house by 10am to allow our housekeeper to have access to change beds and present the house in preparation for our new guests. We request that you leave the house as clean as you find it. 'Had a lovely time in Tiree. The house was great, spacious and cosy during Storm Ali. Thank you for your hospitality. Amazing views from the house. Really enjoyed our stay here. Thanks again. 'Thank you Jim and Susie for such a warm welcome. It's been a perfect location as we have sailed mainly at Gott. Superly comfortable, spacious and warm. Everything we needed after a day on the water with great storage space for all out kit.